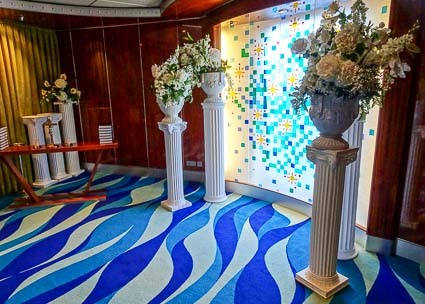 The next morning was typical of sea days during our sunny hot-weather cruise: Passengers of various hues got darker (or, in some cases, redder), and as Gracie Allen might have said: "What does George do? George Burns." 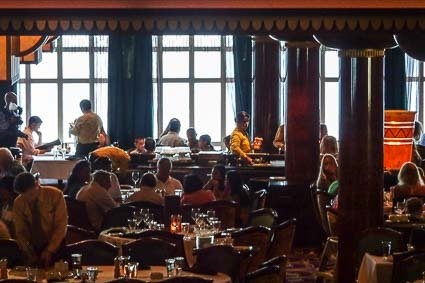 We'd been invited to have breakfast in Cagney's (normally the private preserve of guest in The Haven), so we went inside and made our way to the steakhouse on Deck 13. 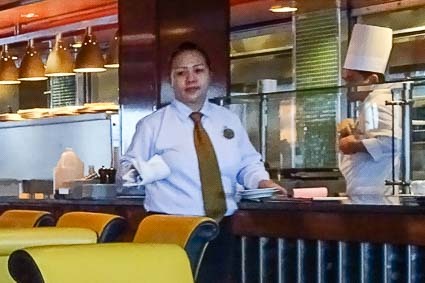 The genteel atmosphere was pleasant, hot items such as waffles were cooked to order, and we had our fill of strawberries and raspberries from the buffet table. 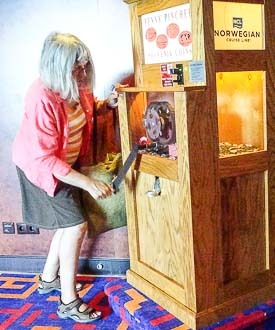 Later, we went in search of old-fashioned interactive entertainment on Deck 7, where Cheryl was able to buy and emboss a souvenir coin at the "Penny Pincher" machine. 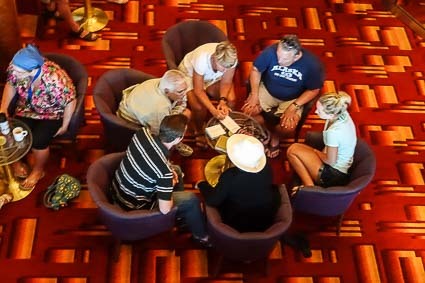 As we walked aft toward the gift shop, we saw teams of passengers concentrating intently on a trivia quiz. 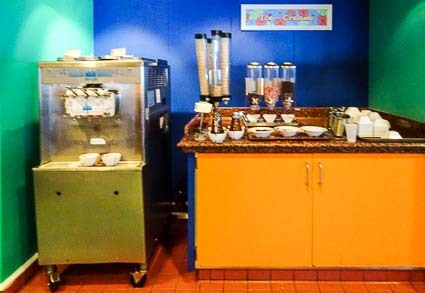 We had lunch in the Garden Café (the hot roast-beef sandwiches were excellent) and made do-it-yourself sundaes at the ice-cream bar. 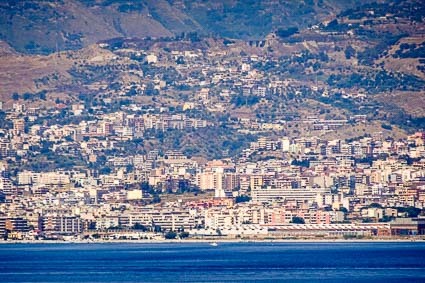 The city of Messina was on the port side of our ship, and the western tip of Calabria (shown above) was starboard. The Pylons of Messina--one in Calabria, the other in Sicily--mark the strait at its narrowest point. 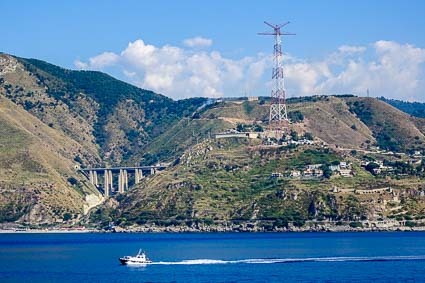 The pylons once carried a high-voltage power line across the Strait of Messina, but the line was removed in 1993. 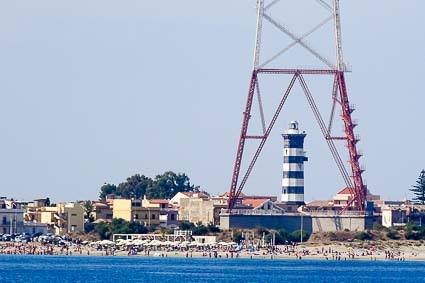 The pylons are now protected as historical monuments, and tourists can ascend the Sicilian pylon (above the lighthouse in the lower photo). 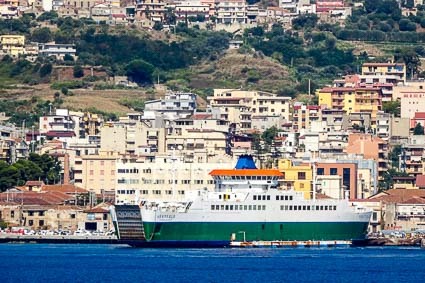 Ferries shuttled back and forth across the Strait of Messina, carrying cars, trucks, and even trains. 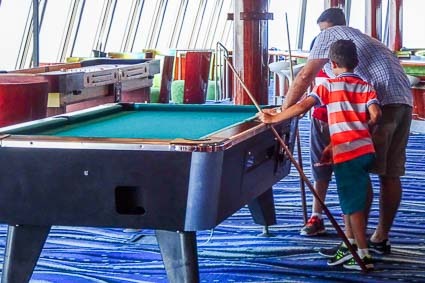 Not all of Norwegian Jade's passengers were as fascinated with the passage through the strait as we were, but we weren't alone at the rail. 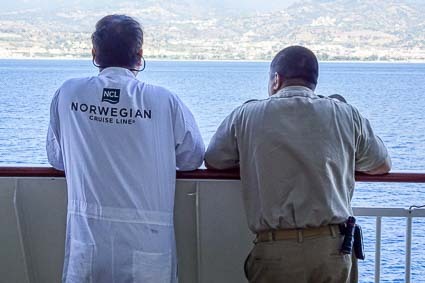 These crew members were also enjoying the view. 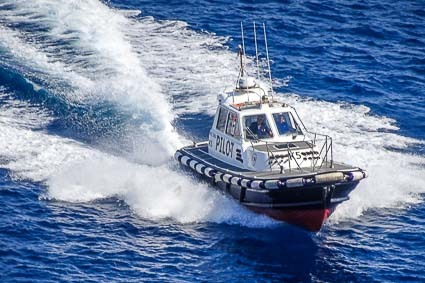 After we'd traversed the Strait of Messina, a pilot boat (which had been following alongside us) sped in to collect the pilot. 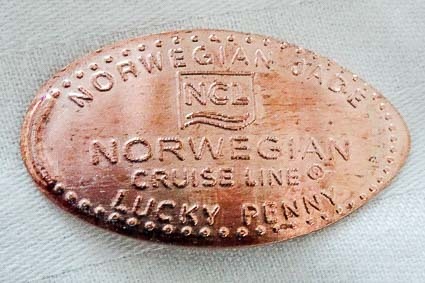 The pilot waved good-bye to Norwegian Jade's officers, crew, and passengers after stepping onto the boat from a rope ladder. 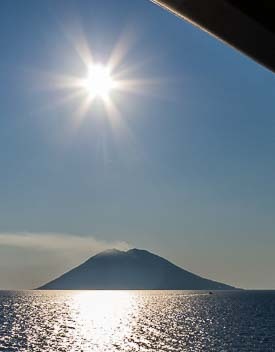 Soon, we passed the island of Stromboli with its active volcano. Stromboli is even more impressive at night, when--during periods of explosive activity--it hurls gobs of red-hot lava into the air several times per hour. 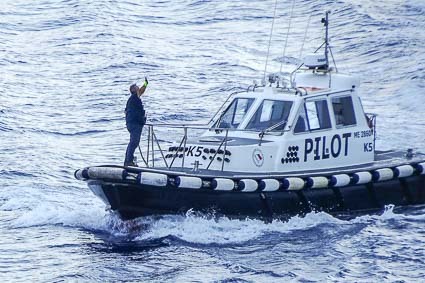 We saw a lively Stromboli fireworks display during our first passage through the Strait of Messina in 2002. 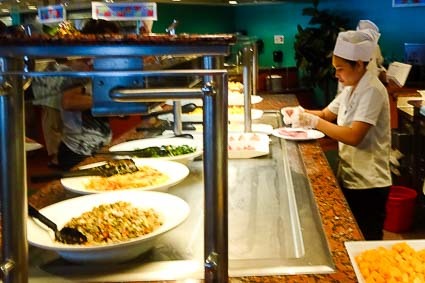 That evening, we had dinner in the Grand Pacific dining room, where--as usual--warm chocolate volcano was on the dessert menu.